Do you work with a homeschool student or tutoring client who would benefit from the Story Ninja program? It’s now available for individual students studying outside the classroom. BRING SIGMUND TO YOUR SCHOOL! Sigmund Brouwer has delivered his captivating Rock & Roll Literacy Show at schools across Canada and the United States. For years, he’s had teachers and librarians raving about is unique and attention-grabbing approach to story and writing. 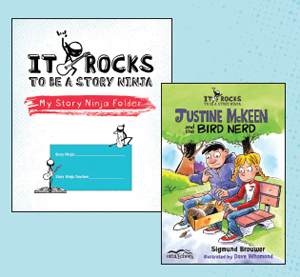 Now, you can bring Sigmund into your classroom as part of the Story Ninja program. Sigmund offers virtual classroom visits via Skype as well as in-person visits. Learn more.